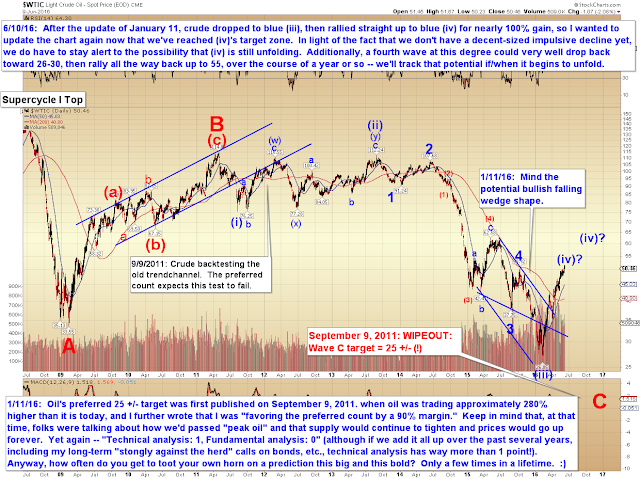 Pretzel Logic's Market Charts and Analysis: SPX, NYA, Crude Oil: What's 100% Gain Amongst Friends? 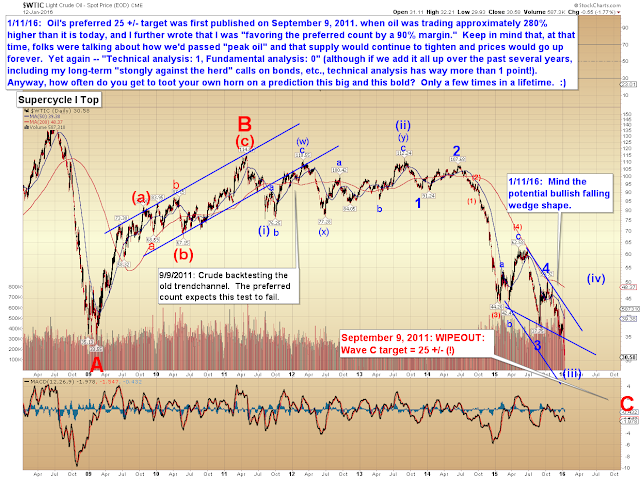 SPX, NYA, Crude Oil: What's 100% Gain Amongst Friends? Things may be about to get interesting for bears again (finally). While we closed yesterday's session only a few points off the 2120 high, we did so after an impulsive decline, and that means we should expect at least one more wave down of equal or greater length. 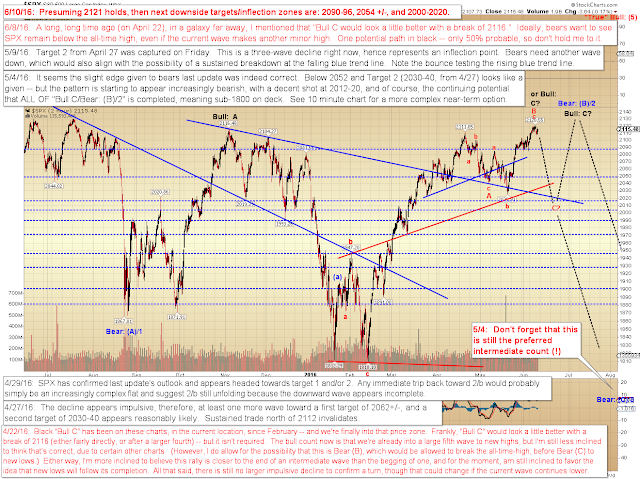 The next thing bears want to see is TWO more legs down (to create an even larger impulsive decline). Even though that larger impulsive decline hasn't happened yet, because this first (small) impulsive decline has come from a massive intermediate inflection point, we should be on early alert to the potential that this may be the beginning of a much larger trend change. Near-term, the first downside inflection zone sits at 2090-96 -- if we blow through that zone, then bulls might want to sit this out until we see an impulsive rally. It sounds funny to say this, but NYA's recent new high is actually bearish per the pattern I've been tracking for the past several months. 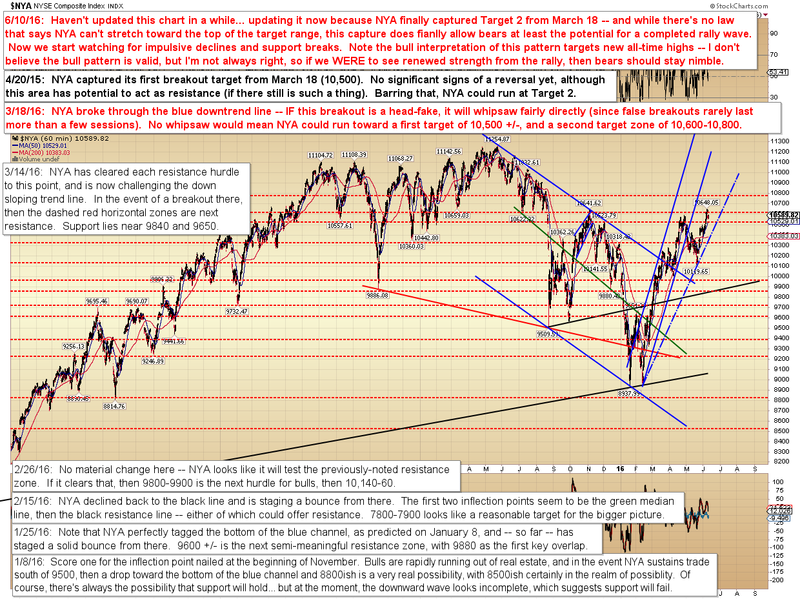 That pattern "needed" to see NYA make a new high beyond 10641, so with that out of the way (and Target 2 from March captured in the process), bears are now free to take this market back if they so desire. From an intermediate standpoint, oil appears to have some fourth and fifth waves to unravel here, thus, due to the size of the overall waves, some very large "backing and filling" price swings may be forthcoming in the not-too-distant future. 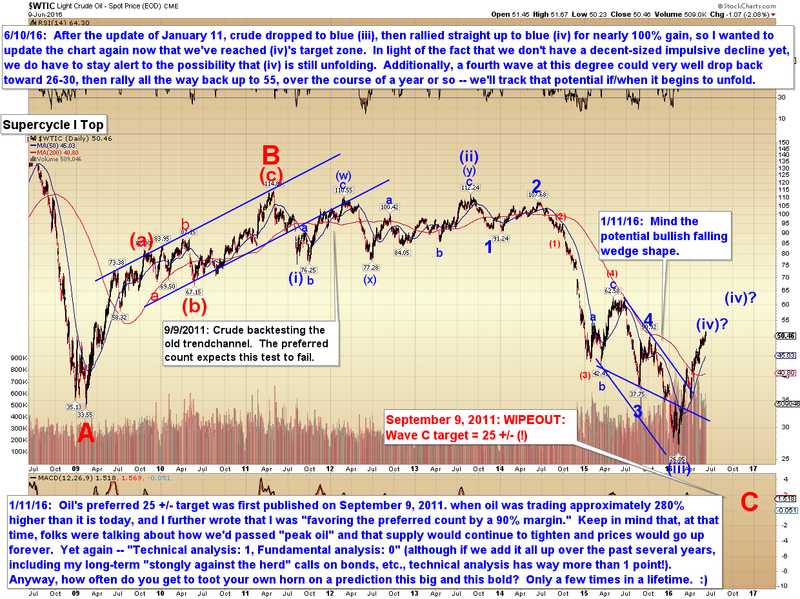 Be aware that a large fourth wave does not need to unravel itself in the time shown on the chart above (i.e. -- this chart is not a "time projection") -- fourth waves are known for their complexity, and it would not be unheard of for a complex fourth at this degree of trend to unfold over the course of years instead of months. It's actually somewhat ridiculous how well that chart has tracked, especially considering that the expected rally from blue (iii) to blue (iv) represented roughly 100% gain, and I didn't hedge, caveat, or show any alternate counts at all. In conclusion, equities have made a small impulsive turn out of the current massive intermediate inflection zone. The preferred count of the past several months continues to remain as such as long as the all-time-highs hold. 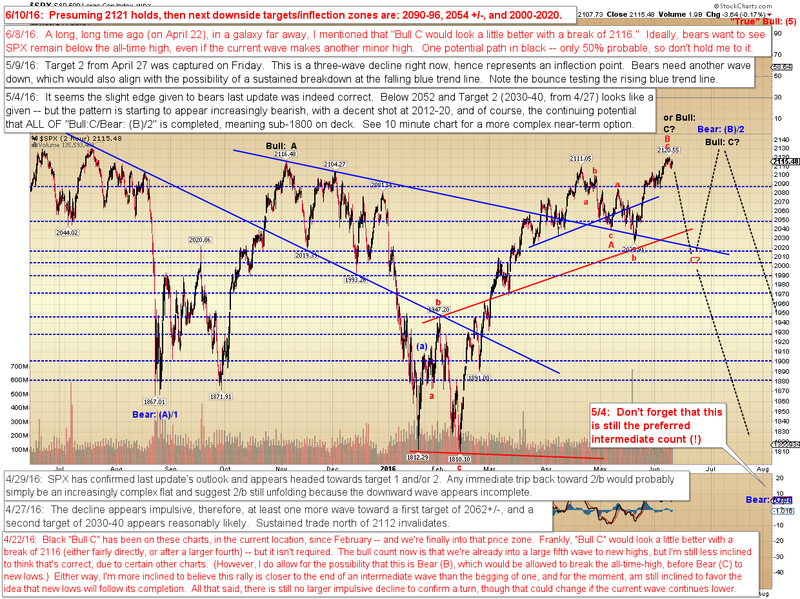 As I wrote last update: SPX finally rallied into the zone it was "supposed" to -- now it's up to bears to get to work, or head back into hibernation. 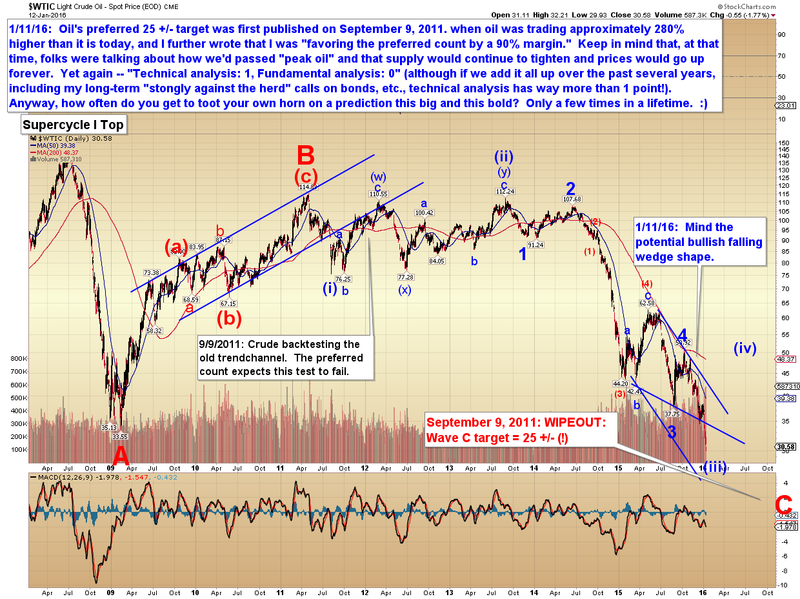 Bears are off to a promising start; now they need to see this decline develop into a still-larger impulse wave. Trade safe.